The early years of the HIV epidemic ushered in a radically different approach to traditional medical and clinical research. Academics and activists held a shared understanding that intimate and ongoing participation of people living with HIV in knowledge production was critical for designing effective responses. As the early activists challenged government inaction across numerous countries not only did the virus spread, people living with HIV knew they had to put themselves forward as the subjects in the research that was fundamental to finding a way to change the trajectory of the epidemic. 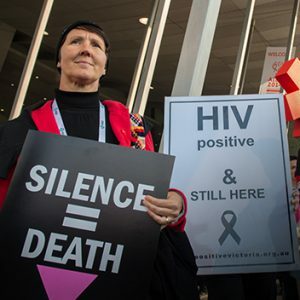 In response to the threat of HIV, our research colleagues embarked upon ground breaking medial, social, policy and community-based research and it is fair to say that scores of researchers from numerous disciplines have often been on the frontlines alongside people living with HIV as our champions, our advocates and our allies. Many people living with HIV realize their relationship with health and community care services is a vital one, ensuring our ongoing health and wellbeing. However, we do not always consider how this extremely personal relationship is predicated upon the work done in labs, universities and research centres around the world by countless researchers from myriad disciplines. As a member of the global HIV research community, read the Call to Action and consider your acknowledgment practices to reflect the role that people living with HIV play in your research. As a person living with or affected by HIV, sign the change.org online petition and add your voice in support of this call to action. Brent Allen is senior advisor of policy and programs at the International Council of AIDS Service Organizations (ICASO). Laurel Sprague, PhD, is executive director at the Global Network of People Living with HIV. Suzy Malhotra is acting chief executive officer at Living Positive Victoria. Rebecca Matheson is global director of the International Community of Women Living with HIV (ICW).